You could win this Axial SXC10 R/C as the Grand Prize for the TrailFest Mini-Crawlers Challenge. The Mini-Crawlers R/C Challenge is Sponsored again this year by SFWDA & our friends at Krawl Off Road. Don't have an R/C of your own, no problem, we have a loaner on site for participants to drive. The "driver" with the fastest time through the gate overall takes home this brand new Axial SCX10 R/C Crawler, Jeep Wrangler G6 Falken Edition valued at $350 MSRP. Awards will be presented Saturday evening during our announcements. We will also have additional prizes awarded and everyone is invited to participate. No additional cost required, and all ages are invited. Bring your own car or borrow one of ours. "We are a Husband and Wife Team and we have a dream. We wanted to do something we love together and that will help build a future for our two sons. We all have a passion for off-roading. That is something that we do as a family. If one of us is on the trail then we all are. We do everything from small RC Crawlers to large full size rigs and custom installations, we do it all! It is a great way for our family to come together. It also allows us to instill morals and values in our children. So, we hope to pass along these values to you, our customers. If there is anything we can do, please feel free to let us know... Thank you!" The Axial SCX10™ Jeep® Wrangler G6™ Falken Edition elevates all terrain trailblazing, marrying the celebrated Jeep® dovetail body with the undeniable performance of Falken WildPeak M/T tires. This SCX10™ was inspired by Falken’s dedication to offroad motorsports and the uncontainable spirit for trailblazing that Axial is known for. The Jeep® Wrangler G6™ Falken Edition bares the special edition livery that echoes Falken’s established legacy. The SCX10™ is packed with a variety of realistic details like a molded interior with a steering wheel, a Poison Spyder Rock Brawler front bumper, a dove-tail universal bolt-in cage, and a roof mounted light bar (LED lights not included). With the WB8 HD Wildboar™ drive shafts and Falken WildPeak M/T tires, the Jeep® Wrangler G6™ Falken Edition delivers durability and performance for every adventure. Rugged. Dependable. That’s the SCX10™. 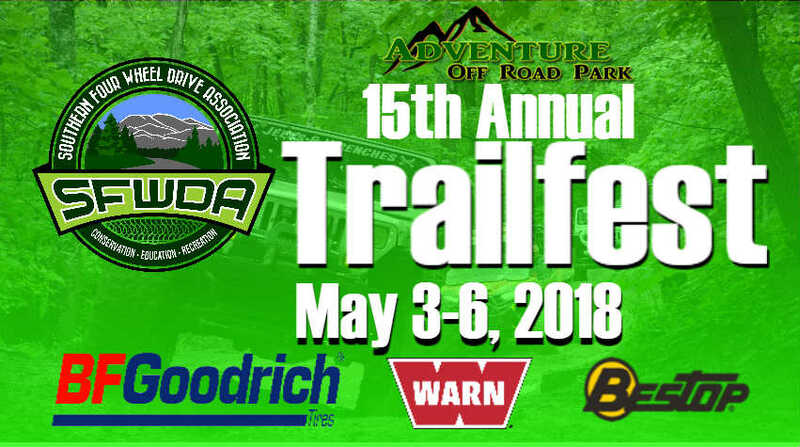 Join us at TrailFest in AOP on Saturday evening immediately following the main announcements, awards, and raffle when we will "Launch" the weekend away as we Thank You for coming and supporting SFWDA! Join us at the main pavilion for an evening full of Live Music, a Bonfire, Food Vendors with a special late night menu, and good ole' fun the whole family is sure to enjoy! S.R.B. 's variety of popular and classic southern style rock & country is great entertainment for all ages! Scott Freels ( Professional Lead singer, Bassist & Song Writer ) and Barry Freels ( Lead guitar and professional blue grass player) have played for 20+ years around the Southeast. They joined with Randy Ruffner ( Rhythm guitar roots in country and gospel) and Sam Teddar (Drummer who is also a singer, song writer and guitar player) to form S.R.B. several years ago to play the music they love best, soulful music in country and classic rock. They have played around the Tennessee area to including many four wheeling events like, The S.R.R.S. series, Dixie Run 29. We are delighted to have them back again to put on a show on for all who come. This is going to be a Fun Packed busy weekend for the whole family. 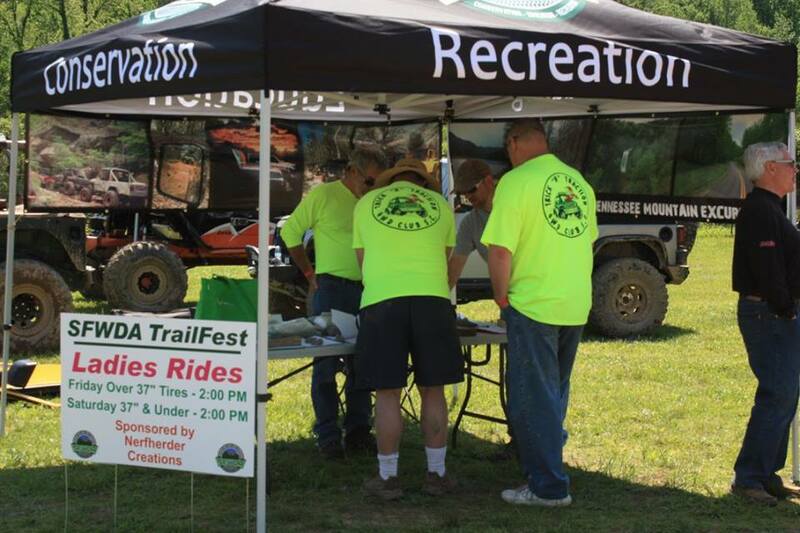 Trailfest 2015 is just two weeks away! This year at TrailFest 2015 ( #trailfest2015) we will have two Pro Photographers on location all weekend long shooting still photos of all participants at various location.